I got this neat model last year when I visited a friend in Denmark (THANKS, CLAUS!!!). 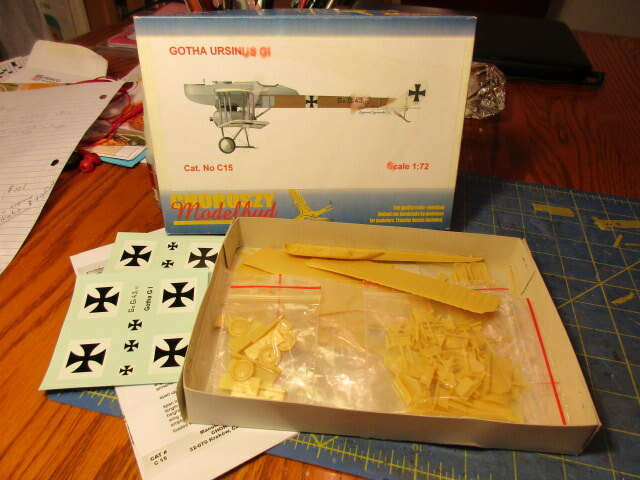 It just happens to be one of my favorite planes and will look great next to my G-III, Staaken and AEG when completed! I've just started and am moving slowly as this takes a fair amount of head scratching and clean up for a good result. Thanks for looking and more soon. A bit more tonight. I sprayed basic linen onto the wings/tails etc and then made "wood" the usual way with acrylic undercoat and burnt umber oils with a top coat of clear orange acrylic. 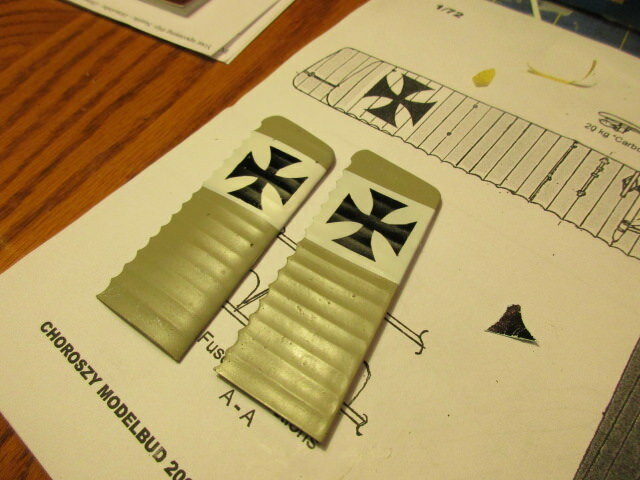 Gloss coated and added some of the first decals. They went on great until I got to the serials. They stuck immediately and I destroyed them both! 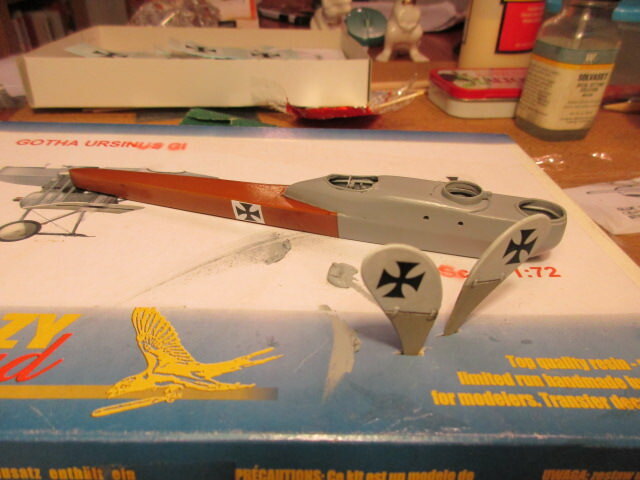 It will be fun to start getting the wings highlighted etc. Looking good! Wow, Dan. The GI looks great. It is also a very interesting subject for me, too. I will definitly watch the progress with high interest. Good to see another unique build coming from your workbench, Dan. I’m all moved from Browns Point to Port Orchard and won’t be able to work on a model for a while. I’ll have to enjoy watching the work of others. We are all victims of history! 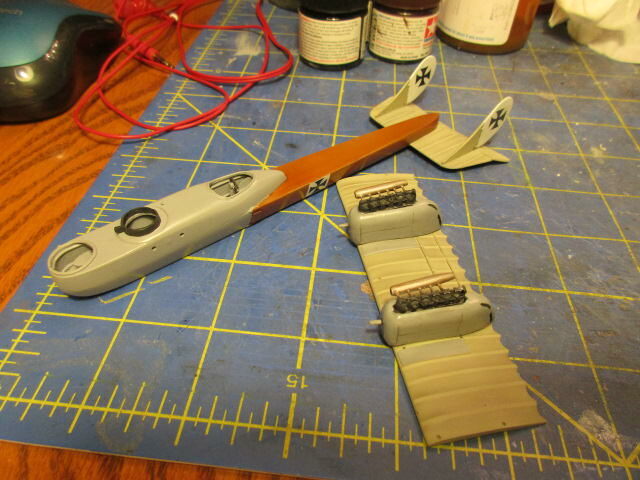 I did the rib tapes on the stab and lower wing assembly, added the basic nacelles and glued the tails on just to show I'm making some progress. It's looking mean now. 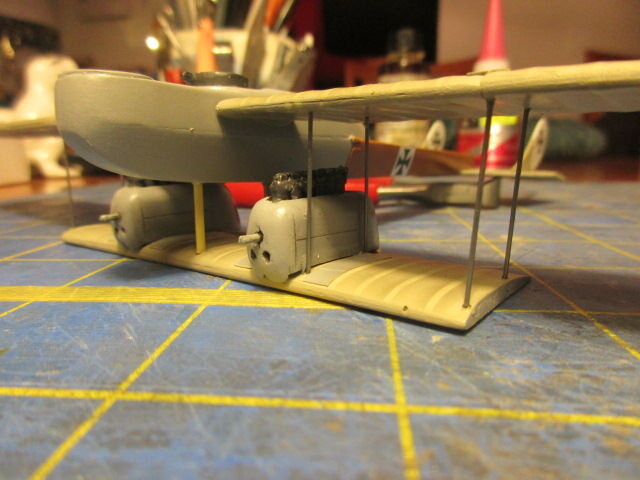 Next steps will be adding wing decals, more rib tapes and then bracing myself for starting to add the wings etc.! P.S. Kevin! Glad to hear your move went well. You'll be sniffing plastic glue soon enough. Great to see a Choroszy kit being built by a master! Here is my likely last update for a week or so...taking my wife to Hawaii. It's the first time we've been on a trip by ourselves in 23 years! My children can now handle themselves at home! 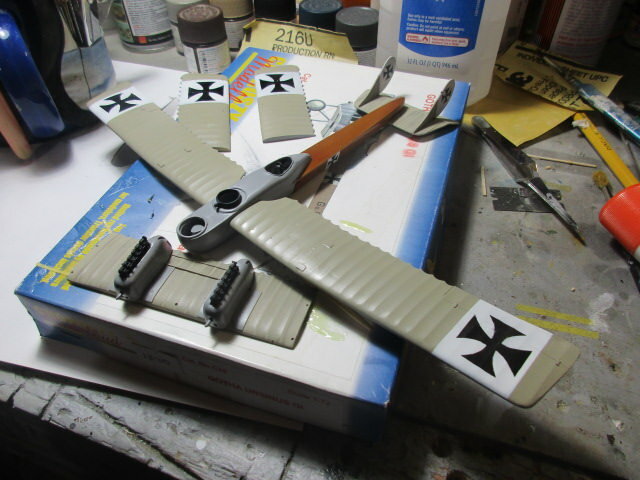 I tried putting the decals on the wings, but they shattered much like the serials. So here I am in the process of masking and painting them on. Luckily, these are pretty easy markings. Just a bit of touch up. I'll do the top four positions tomorrow (these are on both surfaces of both wings). Awesome subject matter Dan ! Thanks, Terri...I've always loved the G-I. Back from the Islands and sort of missed the bench! 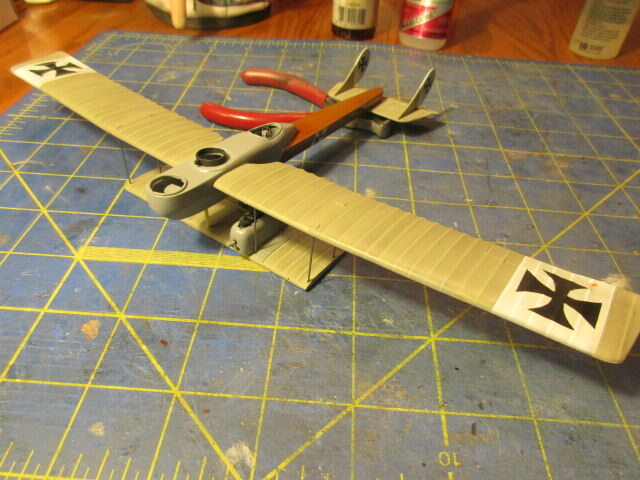 Here is a bit more done by adding the top wing with epoxy. Next will be some rib taping and then figuring out that bottom center section! So many unlabeled struts and the directions are a tad vague! Oh, well. I think I can get 'er done. Wow, Dan! That's spectacular! 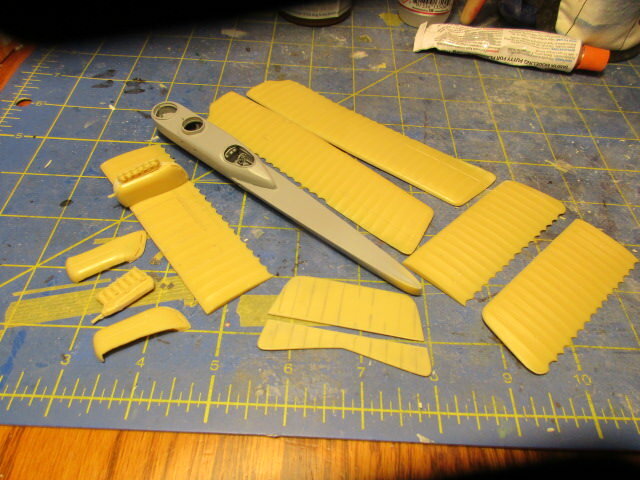 Lonestar Models has been promising the G-1 in 1/48 scale for a while now. Sure hope he does it soon. You're making me want to build one. It's been way too long! And thanks, Bud! 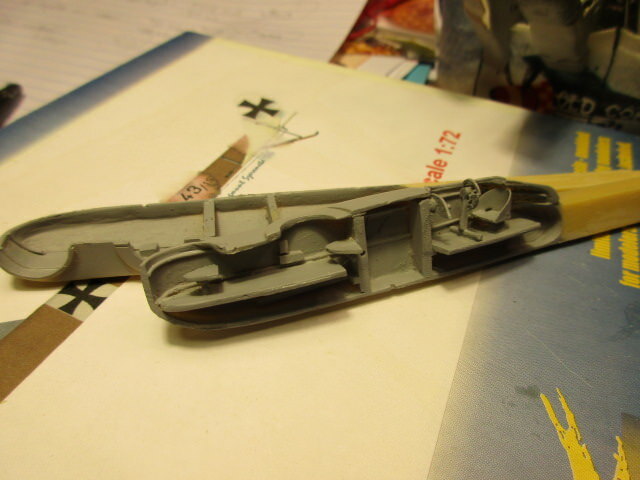 I think this would be great in 1/48th!!! Sign me up. 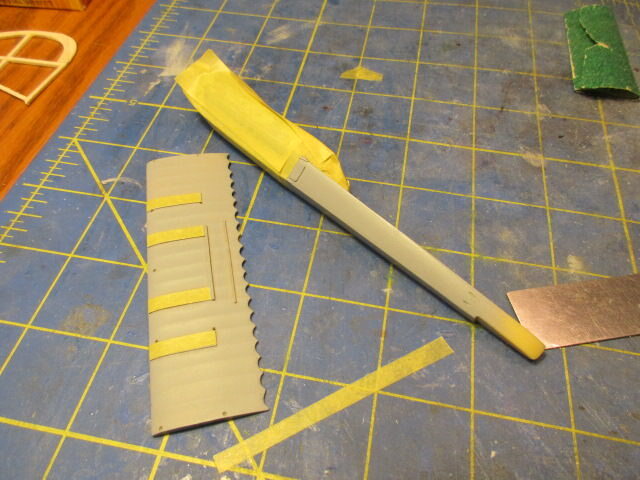 I did get the rib tapes done and then started the wing attachment. 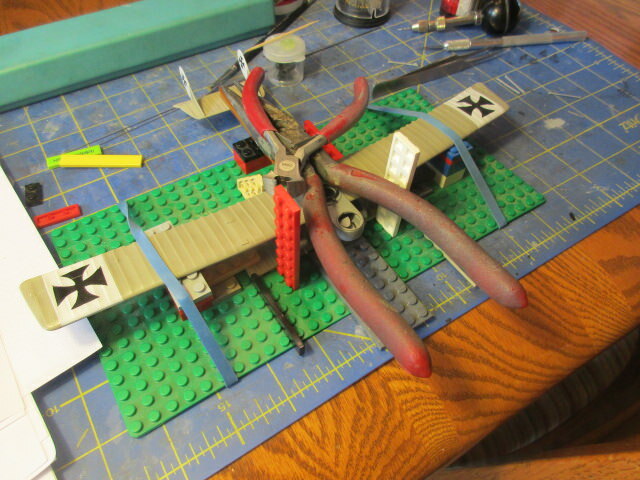 I first tried to use the resin struts and that did not go well...so I ended up making a Lego jig and epoxied thin wire. More to go, but now that this part is done, I think the rest will go pretty well. I have sadly Missed this build up until now. I must say all is really looking Fantastic. Loving everything you have done to date!! Wow, what a great build. Ash nazg thrakatuluk, agh burzum-ishi krimpatul. Looking great Dan, a real beauty.